Richard Thomas is the award-winning author of seven books: three novels—Disintegration and Breaker (Penguin Random House Alibi), and Transubstantiate (Otherworld Publications); three short story collections—Staring into the Abyss (Kraken Press), Herniated Roots (Snubnose Press), and Tribulations (Cemetery Dance); as well as one novella in The Soul Standard (Dzanc Books). 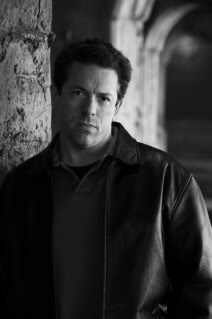 With over 135 stories published, his credits include Cemetery Dance (twice), PANK, storySouth, Gargoyle, Weird Fiction Review, Midwestern Gothic, Gutted: Beautiful Horror Stories, Qualia Nous, Chiral Mad 2 & 3, and Shivers VI (with Stephen King and Peter Straub). He has won contests at ChiZine and One Buck Horror, and has received five Pushcart Prize nominations to date. He is also the editor of four anthologies: The New Black and Exigencies (Dark House Press), The Lineup: 20 Provocative Women Writers (Black Lawrence Press) and Burnt Tongues (Medallion Press) with Chuck Palahniuk. He has been nominated for the Bram Stoker, Shirley Jackson and Thriller awards. In his spare time he is a columnist at LitReactor and Editor-in-Chief at Gamut Magazine. His agent is Paula Munier at Talcott Notch. For more information visit www.whatdoesnotkillme.com. And remember - please show your support for The Shadow Booth by pre-ordering a copy! The crowdfunding for Volume 1 is happening now, until 25 October. Order a copy here.